A couple of weeks ago, my daughter and I ransacked the clearance books at Half-Price Books. My daughter found a science experiment book (Giant Book of Science Experiments by HJ Press) for $1, so we had to buy it! The book has 325 easy experiments. Most of the experiments involve items that you already have around the house. Perfect! 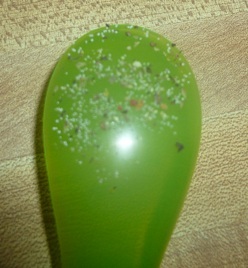 The other night, we conducted a static electricity experiment. 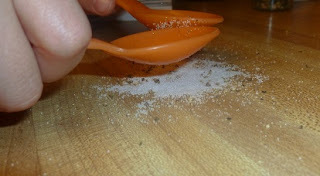 For the experiment, we needed a piece of wool, plastic spoons, salt, and pepper. 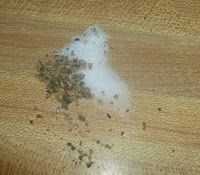 We spread some salt and pepper on the table and mixed it together. Then, we rubbed a spoon against the wool to create a charge. Then, we held the spoon about one inch about the salt and pepper. Both were attracted to the negative charge on the spoon. 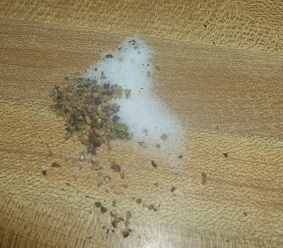 Since the pepper is lighter, it jumped faster to the spoon than the salt. 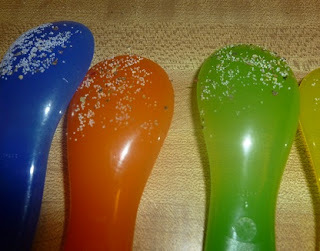 You may have to bring the spoon closer to attract the salt (although, we didn't have to). My daughter loved the experiment and did all sorts of configurations of spoons to try to pick up the most salt and pepper. If you are looking for more information on this experiment, the University of Florida provides a few more details. The experiment is super simple and something great to do if you are stuck inside! Cool! Stopping by from the week-end hop and following.